What is a shoulder infection ? How to treat shoulder infections ? How does a shoulder infection develop ? 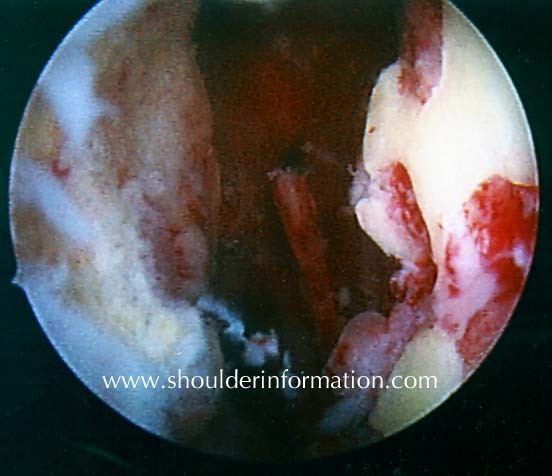 What about a prognosis after a shoulder infection ? What is the natural course of a shoulder infection ? Bacteria are causing a purulent infection of the shoulder joint or its surrounding ( soft tissue ) structures. Most of the time the shoulder itsself is affected, but other joints can be involved, also. People are feeling pain in the shoulder, sometimes radiating into the upper arm. Local swelling, redness and warmness as well as fever or chill can occur, but are rare. A lot of shoulder infections will be recognized late, because of the slight clinical symptoms. Night pain might be another possible symptom. Shoulder infections are a very severe disease, which have to be treated at once, as soon as they are diagnosed. The infective source has to be removed in an operation. The shoulder joint itself can be irrigated arthroscopically or in an open procedure. Several operations within a few days might be necessary. Antibiotic chains and irrigation drainages are used to clean the shoulder joint. X-ray of the left shoulder: antibiotic chain beneath the deltoid muscle after a shoulder infection. Bacteria can get into the shoulder joint from out- or inside. They get into the shoulder joint from the outside after shoulder traumata with open wounds, after injections into the shoulder or operations. Bacteria can spread from the inside - over the blood vessel system – while people are suffering from a cold, infection of the urinary bladder or teeth, and so on. According to time one can distinguish between chronic and acute shoulder infections. Shoulder infections may be localized intraarticular - within the main shoulder joint - which has a bad prognosis, because of the destruction of the main joint. Or they may be localized extraarticular, e.g. beneath the deltoid muscle and / or within the subacromial tunnel. The prognosis is a little better. In hematogenous shoulder infections bacteria spread over the blood vessel system from another focus, like a tooth abscess or urinary bladder infection. These so called secondary shoulder infections might also occur after operations or infections into the shoulder ( also called idiopathic shoulder infections ). Even in generalized diseases, which which are associated with immunosupression - like diabetes, Parkinsons disease or rheumatoid arthritis - shoulder infections may develop. What about the prognosis after a shoulder infection ? The earlier a shoulder infection is diagnosed and the earlier it is treated the better is the prognosis. A common logterm problem after an infection of the shoulder is a partial shoulder stiffness and possible arthritis with joint destruction. massive destruction of the shoulder joint after an infection. Untreated a shoulder infections most of the time ends in an extraordinary destruction of the shoulder joint, which can make a shoulder arthroplasty necessary. The affected shoulder becomes stiff and chronic pain will develop. Very bad are situations, when a shoulder infection spread into other areas of the human body, like heart valves, brain, lung, vertebral bodies and others or when a generalized sepsis develops.